Sandy Pelletier, an assistant professor of nursing at the University of Maine at Fort Kent, left, shows nursing students how to utilize technology to monitor their patients in the nursing simulation lab on campus in April. Maine’s current and projected shortage of registered nurses remains real despite some success among the state’s nursing programs in recent years to boost their numbers of graduates. The state recorded 801 nursing graduates from its public and private nursing programs in 2017, up from 659 in 2015, 701 in 2013 and 563 in 2011. “But it’s still short of what we need,” Lisa Harvey-McPherson, co-chair of the Maine Nursing Action Coalition, said Tuesday at a news conference at the University of Southern Maine in Portland. A 2017 analysis of Maine’s nursing employment situation by the Center for Health Affairs projected that the state would be short 3,200 nurses in 2025, based on 2015 employment numbers. Based on the 2017 enrollment numbers, projected vacancies are now down to 2,700, according to the Ohio-based consulting group. Already, registered nurses are in high demand. There were 1,459 registered nurse vacancies in the state in 2016, according to a Maine Department of Labor survey. It was the profession with the fifth highest number of vacancies. The aging population of registered nurses is the primary reason behind the projected shortage, as 30 percent of all registered nurses were above age 55, according to the Center for Health Affairs data, with nearly 50 percent nurses above 55 in some regions. To fill all the vacancies created by retiring nurses by 2025, the Maine Nursing Action Coalition’s target is ultimately 1,050 graduates per year. But nursing programs can’t grow their enrollments given current resources, according to Harvey-McPherson. “We believe we’ve maxed out on resources to increase the number further,” she said. Health care and educational institutions are partnering across the state to help maximize graduation numbers and on-the-job placements, but a lack of faculty and nursing labs mean that the target of 1,050 annual nursing graduates is unlikely, she said. According to the USM data, nursing programs across the state rejected 1,204 qualified applicants in 2017 because they didn’t have enough faculty. 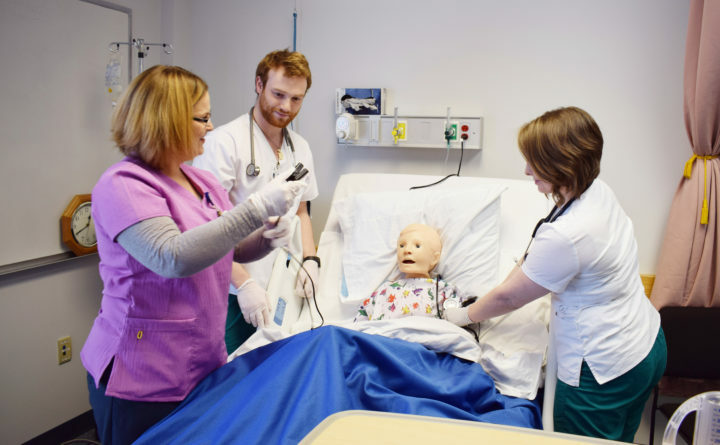 In the Bangor region, a dedicated nursing education unit at Northern Light Eastern Maine Medical Center aims to double the number of clinical placements for the University of Maine and Husson University nursing students in coming years, according to Harvey-McPherson. The Bangor hospital also works with Mayo Regional Hospital in Dover-Foxcroft and Northern Light Maine Coast Hospital in Ellsworth to place nursing students at the regional hospitals, and allow the students to attend lectures via Skype, she said. She described recruiting faculty, growing the programs to admit more students and providing more resources such as nursing labs as necessary steps to make up the projected 2,700-nurse gap. Even if Maine nursing programs graduate more students, the state will still need to recruit 265 nurses from other states or countries each year to close the staffing gap. The University of Maine System unveiled its Nursing Workforce Plan in September. The system committed to doubling nursing enrollments over the next five years, pending approval of Question 4 on November’s ballot. Nursing leaders and USM President Glen Cummings held a press conference Tuesday to push for voters’ approval of the $49 million plan, which includes $12 million in investments to expand nursing education at the state’s universities.